Whether you want to ride uphill or simply pedal your way on the pavements, there is nothing quite like an electric bike. It does not matter if you are a 12 year old or a 50 year old; as long as you need some activity, you can make the most of a bike like that. Now imagine an electric bike that is foldable, sturdy, reliable and power-assisted! Isn’t that a fascinating thing to own? If you are wondering how to lay your hands on such a bike, then you must take a look at the Phantom X2 review here. The Prodeco Phantom X2 is considered to be a perfect combination of aggression and affordability by the industry insiders. It has enough features to stand out among other folding electric bikes in the market. There is no doubt about the fact that Prodeco Tech’s quality control is consistent. If you are already curious about the other incredible features of the bike, then read on to know what else is on offer! What are the best features of the Prodeco Phantom X2? While offering you the best-in-class performance of an electric bike, the Prodeco Phantom X2 is easily foldable that will make your short trips even more convenient. If you plan to drive up to a certain point on the way to your destination and then intend to take your bike uphill or downhill, you can do so with absolute ease. Fold and pack your bike in your minivan and pack it back when not in need. The folding frames of the Phantom X2 are made of aircraft grade aluminum. The frame is essentially designed to be string, portable, comfortable and durable. However, with its emphasis on strength and durability, there is no compromise on the uniqueness of its style. It features a heavy duty adjustable folding mechanism along with a safety latch. These two features ensure that you can fold the entire bike in a total time of 15 seconds. 95% of the components and hardware of the Phantom X2 are made of aluminum alloys, stainless steel and cromoly. The manufacturer has paid minute attention to detail by providing alloy nut headset, alloy chain guard and stainless steel spokes. The worst enemies of a bike are the natural elements. The impact of natural elements on a bike could lead to rust and corrosion. The manufacturer’s inclusions of weatherproof elements in the bike will let you cherish your bike rides year after year without worrying about damage and repair. It will not be an exaggeration if you are told that your Prodeco Phantom X2 bike is straight out of a Batman movie! Sporting a satin black finish with a red trim, it looks just right for your adventurous ride. The bike’s components come in two variants. The first is an anodized sandblasted black and the second is an anodized polished black. Having discussed the aesthetics, the Phantom X2 is also quite competitive when it comes to performance. 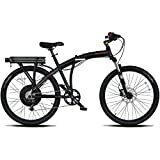 Its 500W output motor offers unmatched performance as far as an e-bike is concerned. It also features a quick waterproof disconnecting option right at the motor. This makes tire and tube changing a lot more convenient. If electric bikes have always made tire changing look troublesome, here is some relief! The connector is located a few inches away from the motor. All you need is a two second disconnect to remove and change the motorized wheel. One of the primary components of an electric bike is the controller. When you buy the Phantom X2, you will soon realize that its controller is a maintenance free unit. If your controller needs repair or replacement, it can be changed without any hassle. This is because of the wire harness and simplified controllers that allow quick connecting and disconnecting of the controllers. The Phantom X features a maintenance-free and sealed cartridge bearing system for its bottom bracket. Both the upper and lower cartridge bearing headsets are designed for strength, durability and zero rust. The bottom bracket contains a spindle that is especially made of cromoly for additional strength and rust-resistance. The front axle of the electric bike is designed in a way so as to allow the removal of the front wheel in 30 seconds. This comes in handy if you live in an area where thefts are a common issue. Once you remove the front wheel, the bike cannot be used. Even when you need a quick service or repair, your tube and tire changes can be done easily and quickly. This electric bike features 12G stainless steel spokes. If you are not aware of what these could do for your bike, imagine maintenance-free performance for years and relate that with the bike at hand. Moreover, stainless steel is naturally resistant to rust and corrosion. The choice of tires is crucial to a high-performance e-bike. The 26×2.1 tires of the Prodeco Phantom X2 are built to offer low resistance along with a smooth ride. The tires also offer great surface grip while being ridden on the roads. Just when you thought that the bike couldn’t get any better, its adjustable stem comes up as yet another important feature. Different riders have different riding positions and that depends on their size and comfort levels. If you are a fidgety rider, you will find your comfort in this bike with a quick adjustment of the handlebar stem. Whether you want the bar to be higher and closer or lower and forward, the stem is perfectly capable of adjusting the degree and angle. The handlebar can also be used for storing, shipping and transportation purposes. This is not your standard electric bike with plastic pedals. You can thank the manufacturers for years of use without hassle. The folding pedals are made of aluminum and offer the best quality in its range. The battery and hub motor, being located at the back of the bike make the rear quite heavy. There are no options of pedal-assist. LED battery level indicator is not as precise and accurate as LCD display. Easy foldable option makes it convenient to store and transport. This is not a regular feature among e-bikes in general. More efficient lithium batteries can be charged at higher amps. This is unlike the batteries of other electrical bikes that tend to deteriorate at higher temperatures. A regular electric bike will help you to work out but will leave you restless but the Phantom X2’s power-assisted motor is a blessing in disguise. The engine of the bike is quieter than other electric bikes. The Phantom X2 price is yet another factor. It is highly affordable and gives you more reason to invest in it. To sum it all up, opt for the Prodeco V5 to buy a perfect combination of comfort, style and performance. The Phantom X2 is not just an electric bike but is a find in itself. The easy folding option, the strong and durable build, the maintenance-free structure and the easy portability make this a perfect traveling partner. 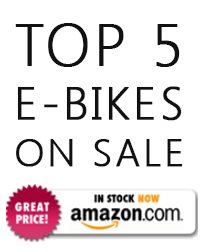 The bike is best suited for those who are looking for an e-bike on a budget but would not want to compromise on performance. Whether you are a daily commuter or an adventure-seeker, this bike can simply be taken anywhere and included in your everyday life activities. 1 What are the best features of the Prodeco Phantom X2? 1.1 What could have been better? 1.2 What makes it better than its competitors?